On Thursday, President Trump awarded the Medal of Honor to former SEAL Team 6 officer Britt Slabinski. There are well documented allegations of war crimes committed by Slabinski in Afghanistan, including the killing, torture and dismemberment of unarmed Afghan men. Slabinski is the 12th living person to be granted a Medal of Honor in relation to the invasion and occupation of Afghanistan. The establishment press has completely sidestepped the war crime allegations against Slabinski, focusing instead on the controversy generated by an internecine battle between the Air Force and Naval Command over a poorly executed operation that Slabinski led in 2003. That operation resulted in five American deaths. One of the men killed, an Air Force officer named John Chapman, was left behind to fight alone after Slabinski ordered troops to evacuate their position on Takur Ghar, a mountain near the Pakistan border. Slabinski claims he believed Chapman to be dead when he evacuated the troops. Drone footage, however, suggests that Chapman survived and was left to fight off attacks on his own. Days after the Takur Ghar operation, many SEAL Team 6 troops, including Slabinski, reportedly began mutilating the bodies of the men they killed in raids. These acts were purportedly done as revenge for the Taliban’s mutilation of SEAL Neil Roberts on Takur Ghar. Slabinski himself admitted that he led an ambush against what he claimed were Al Qaeda fighters attempting to enter Pakistan. Slabinski and his subordinates killed all of the men and subsequently fired “security shots” into the dead. Slabinski’s perverse form of “therapy” led the SEAL Team 6 leadership to remove him from combat for four years. Yet in 2007, Slabinski was made squadron master of the team’s Blue Squadron. The Blue Squadron was investigated by Naval Criminal Investigative Services (NCIS) and the Joint Chiefs of Staff twice in 2007 for multiple complaints—from Afghan allies to SEAL Team 6 troops—about incidents of unlawful combat and abuse of the dead. Tales of orders to kill all male Afghans on raids, regardless of combat status, as well as reports of Afghan casualties being scalped or otherwise mutilated began to circulate almost immediately upon Slabinski’s reentry to combat. SEALS were reported to have used specially made hatchets to brutally attack and then dismember Afghan troops. The grisly act of “canoeing,” in which SEALS would fire close-range upon the skulls of dead or dying men in order to expose their brain matter, was widely mentioned. Slabinski denied the accusations, claiming that he had neither ordered a beheading nor witnessed one. NCIS concluded that no war crimes had occurred. Slabinski continued with SEAL Team 6 for three years after these investigations. He was investigated again, this time for killing unarmed combatants, including school boys, only to be cleared of wrongdoing. It was not until 2010, when Slabinski’s own admissions of killing unarmed males imperiled the SEALs’ privileged status in the military, that he was dismissed. 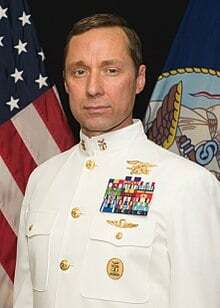 His career was saved by Rear Admiral Timothy Szymanski, then commodore of Naval Special Warfare Group 2, who tapped him as his command master chief. Szymanski was instrumental in Slabinski’s nomination for the Medal of Honor. In 2012, Slabinski, still enraged at the SEALs for dismissing him, told the New York Times that far from being the originator of war crimes, he had actually helped rein in bloodthirsty SEALs. Of the beheading incident, he said that he had caught one of his men attempting to cut a man’s throat and that he had ordered him to stop. The SEALs, outraged at the negative publicity, added Slabinski’s name to the “stone of shame,” a list of former SEALs who are barred from ever visiting command again. The glorification of war criminals is by no means peculiar to the Trump White House. The Obama administration paid homage to CIA operative Johnny Spann, who was killed in 2001 when prisoners at the Qala-i-Janghi prison fortress near Mazar-i-Sharif in northwest Afghanistan rebelled against Spann’s brutal interrogation methods. Video filmed just prior to the rebellion shows Spann tormenting and threatening John Walker Lindh, the US citizen who had joined the Taliban and was imprisoned in the fortress. Lindh was among a handful of prisoners who survived the US bombing of the fortress, carried out in response to the prisoners’ uprising. Some 800 unarmed prisoners were slaughtered. The CIA carved Spann’s name into its Memorial Wall and listed him in the agency’s Book of Honor. In an extraordinary press conference at CIA headquarters in December of 2014, Obama’s CIA director, John Brennan, denounced the just-released Senate Intelligence Committee report on CIA torture while paying tribute to Spann.